I found many times I needed to force a computer or a user policy refresh for the SCCM client to avoid having to wait to test updates and packages. Having to visit the client and enter to configuration manager settings in control panel can be time consuming and disruptive if someone is currently using the computer. 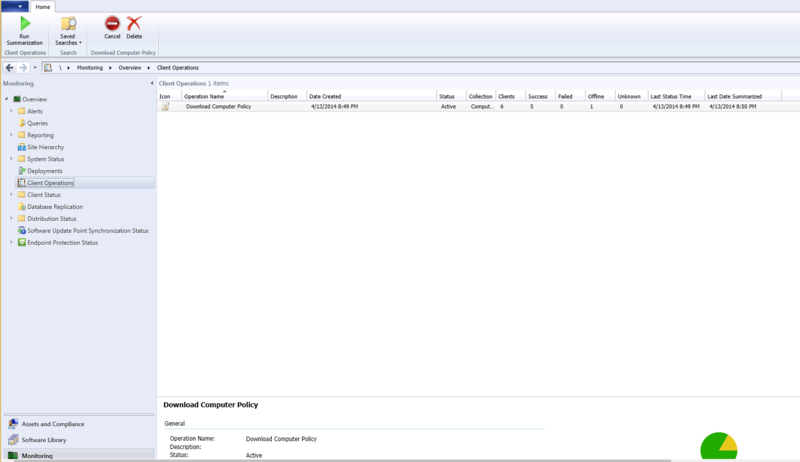 There is a quick and easy way to download the machine or user policy remotely for a computer or a collection of computers using the Systems Center Configuration Console. In this example I will be downloading the computer policy for the “Computers” collection. If you wanted to refresh the machine policy for a single computer, just choose the individual device and follow these instructions. Open the SCCM console and navigate to the “Assets and Compliance” node. Right click the collection group or the individual computer for which you would like to refresh the policy. Choose “Client Notification” then “Download Computer Policy” as shown below. You will receive an informational message, Click “OK” as shown below. To see the progress of the update, navigate to the “Monitoring” node, then highlight “Client Operations” on the left pane. You will see the status on the right side. To move things along, you can click “Run Summarization on the top of the screen. As you can see below, 5 clients downloaded the policy successfully and one was offline. NOTE: You may need to click on another node and then back to “Client Operations” to get the status refresh to display. For example click “Deployments” and then back to “Client Operations” to see the refresh.